The Defence Acquisition Council (DAC), in a landmark decision today, approved procurement of 111 Utility Helicopters for the Indian Navy at a cost of over Rs. 21,000 crores. This is the first project under the MoD’s prestigious Strategic Partnership (SP) Model that aims at providing significant fillip to the Government’s ‘Make in India’ programme. SP Model envisages indigenous manufacturing of major defence platforms by an Indian Strategic Partner, who will collaborate with foreign OEM, acquire niche technologies and set up production facilities in the Country. The model has a long-term vision of promoting India as a manufacturing hub for defence equipment thus enhancing self-sufficiency and establishing an industrial and R&D ecosystem, capable of meeting the future requirements of the Armed Forces. The contract when finalised, would result in a vibrant and wide-spread Defence industrial eco-system in the Indian Aviation Sector with the Private Industry and MSMEs as major stakeholders. In further quest for modernisation of the Armed forces the DAC also granted approval to a few other proposals amounting to approximately Rs. 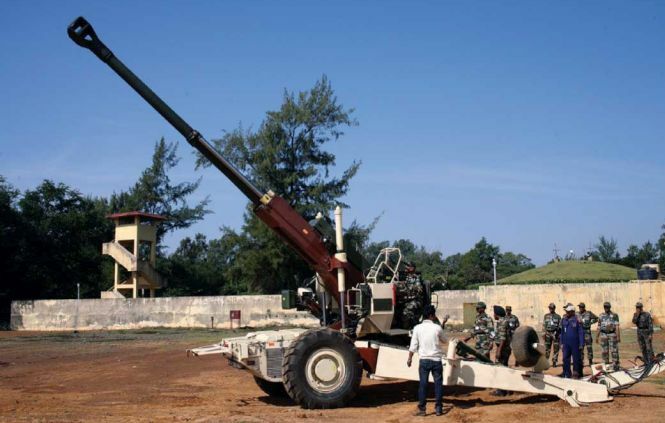 24,879.16 crores, which included approval for procurement of 150 numbers of Indigenously Designed and Developed 155 mm Advanced Towed Artillery Gun Systems for the Indian Army at an approximate cost of Rs 3,364.78 crores. These guns have been indigenously designed & developed by DRDO and will be manufactured by production agencies, as nominated by DRDO. They are likely to be the mainstay of Artillery in the near future. A nod to these major schemes will provide a fillip to the ‘Make in India’ push by the Government, will help create self-reliance in the Country in Defence manufacturing sector and has the potential of making the Defence Industry as a major engine of India’s economic growth. To enhance the capability of Navy at sea, approval has also been granted for procurement of Anti-Submarine capable, 24 in number Multi Role Helicopters, which are an integral part of the frontline warships like the Aircraft Carriers, destroyers, frigates and corvettes. Availability of MRH with the Navy would plug the existing capability gap. In addition, procurement of 14 Vertically Launched Short Range Missile Systems was also cleared by the DAC. Of these, 10 systems will be indigenously developed. These systems will boost the self-defence capability of ships against Anti-Ship Missiles. Last edited by ashdoc; September 1st, 2018 at 04:51 AM.